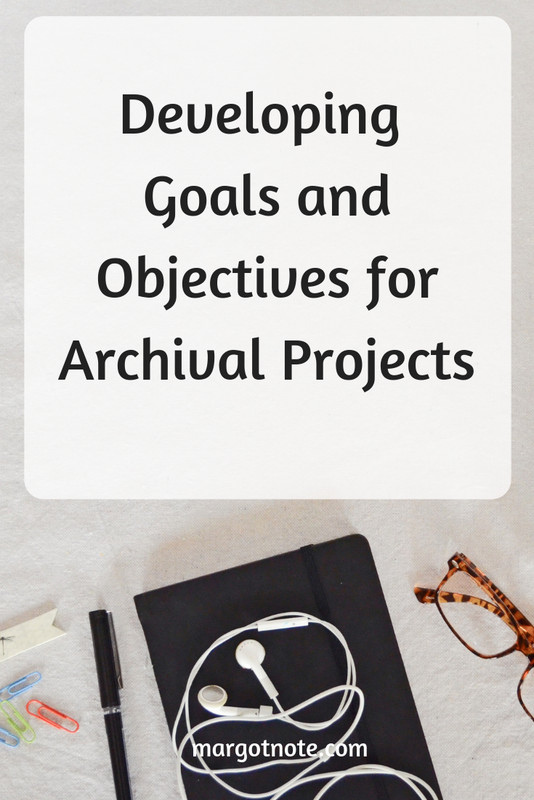 Goals describe the purpose of the archival project, while objectives express the steps necessary to achieve goals. The goals should be prioritized, so the team knows which goal is most important if a trade-off needs to be made. Document each goal and tie it to the project vision. Goals describe what you want to achieve in non-technical terms, and they should align with organizational strategy. They clearly define the outcome of the project so that everyone understands what is to be accomplished. A goal statement is a point of reference for any questions that arise regarding the project’s scope or purpose. The sponsor and project manager must set expectations and encourage the refinement of the goals so that the team gains ownership of the project, builds cooperation, and reduces areas of conflict. A goal should be presented in such a way that one can determine if it has been achieved. If the goal of the project is to produce a deliverable with a specified quality at a particular time and within a cost limit, it is easy to check whether the goal is achieved. Goal statements should be short and to the point. The goals should exclude any information that might commit the project to impractical dates or deliverables. Goals need to be translated into objectives if they are to be used for planning and guiding the project’s assessment. Objectives should define what is to be achieved, when it will be completed, and how it will be performed. Objectives are a more detailed version of the goal statements. The purpose of objective statements is to clarify the boundaries of the goals and define the scope of your project. Objectives specify a future state, rather than an activity. They are statements that tell the project team what result is to be achieved. Problem-solving to determine methods of reaching objectives should be kept open so that solutions can be determined later. If the approach is written into the objectives, it may lock a team into a method that is unsuitable for the project in the long run. Objectives range widely. Financial objectives refer to the budgets themselves or to the standards organizations employ to assess their performance. Examples of financial objectives include staying within budget, increasing revenue or profit, or cutting costs. Performance objectives include meeting deadlines, satisfying requirements, or conforming to specifications. Technical objectives relate to the implementation or improvement of technology. Quality objectives represent improvements in services. Prioritizing objectives may help eliminate tasks if the commitment to your budget or completing the project on time becomes an issue. Priorities will also assist you if you need to reorganize the project or deploy team members. If two people are completing a task, and assistance is required with another task associated with a higher priority objective, you will be able to adjust the efforts to be most useful. Use the word SMART to remind yourself of the areas to consider when setting objectives. The acronym stands for specific, measurable, accurate, realistic, and time bound. Specific objectives tell exactly what, where, and how to address the need. Measurable objectives have metrics in place so that you know whether you have succeeded or not. Accurate objectives should be described in a precise manner, so errors are nonexistent. Realistic objectives should be achievable in the time allowed. Time bound objectives must include a precise date for achievement. You may also consider writing SMARTER objectives that are extending and rewarding. The objectives should stretch or extend the capabilities of the organization. Rewarding objectives may be more difficult to gauge, but the achievement of an objective that serves the parent body will often translate into greater support for the organization and the project in future. For an archives, one goal of a project could be to increase the use of primary sources in history education by encouraging cooperation between historical records repositories and educators. Several objectives may stem from that goal. For example, one objective may be to support a project of history educators and archivists to create history curriculum based on analog and electronic records. Another objective may be to develop models for student tours and the use of archival facilities. These objectives can be further broken down into activities, performance indicators, and possible leads for partnerships.